This playful vision of “Apollo Amusing the Gods” (dated November 16) was published November 6, the day after the presidential election. It was clearly designed to provide general comic relief. 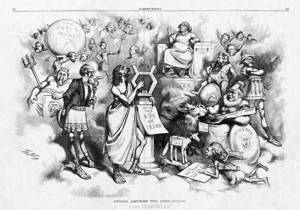 At the center of the action, Whitelaw Reid is Apollo, god of the sun (and music, poetry, and other civilized pursuits), performing on his lyre (a pun on Reid’s alleged journalistic lies), with the usual “This Is Not An Organ” notice attached. Greeley (right) is Minerva, goddess of wisdom, who strokes a donkey wearing the hide of a lion. In front of Greeley as Cupid is Theodore Tilton, biographer of free-love advocate Victoria Woodhull.